Richard Agustin Rodríguez…Enjoys fishing and cooking in his spare time…Lists Pedro Martinez as his favorite player growing up...Grew up on his family's farm in the Dominican Republic. Led all National League rookie relief pitchers in strikeouts and ranked third among all Major League rookie relievers behind Tampa Bay's Ryan Yarbrough (106) and LAA's Noe Ramirez (93)...Set the club record for most strikeouts by a rookie relief pitcher (was 84 by Blas Minor in 1993)...Tied for fourth among all N.L. 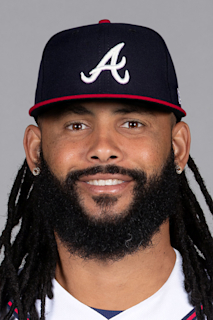 relief pitchers in strikeouts...Held left-handed hitters to a .155 batting average (18-for-116) and just three extra-base hits...Was scored upon just once in his final 19 appearances, dating back to 8/16 (19.2ip/1er - 0.46 ERA)...Posted a 1.83 ERA (19.2ip/4er) in his 22 games pitching in the seventh inning... Produced a 1.88 ERA (28.2ip/6er) in 30 games against teams from the N.L. Central division...Led the Pittsburgh staff with 11 wild pitches and tied for second in the league in that department...Began season with Triple-A Indianapolis, where he made two scoreless outings (5.0ip/1h/2bb/9so)... Was selected by Pittsburgh on 4/13 and made debut with the Pirates on 4/17 vs. Colorado (1.0ip/0r)...Struck out a career-high six batters in 2.2ip on 4/19 at Philadelphia... Suffered loss in the 11th inning on 4/22 at Philadelphia... Had his first career plate appearance on 5/1 at Washington and struck out...Matched his career and season-high with six strikeouts in 2.0ip on 5/6 at Milwaukee; also struck out in his second plate appearance...Had 21 K's in his first 11.1 innings of work after his first eight appearances...Picked up his first Major League win on 5/9 at Chicago (AL)...Was placed on the 10-day D.L. on 6/8 (retro to 6/7) with right shoulder inflammation...Threw 20 pitches in a simulated game on 6/16 at PNC Park...Was reinstated from the D.L. on 6/18...Pitched a career-high 3.0 innings and struck out five batters on 6/23 vs. Arizona...Made 17 consecutive scoreless appearances (18.0ip/30so) between 8/16 and 9/24...Went hitless in two at bats. Spent entire season with Norfolk (Orioles' AAA) while also seeing first big league action as a September callup... Led the Tides in appearances while also finishing second on the club in saves...Ranked fourth among International League relievers in fewest baserunners per 9.0 innings pitched (9.49) and fifth in fewest walks per 9.0ip (2.00)...Also tied for sixth on the circuit in saves while converting 10 of his 12 opportunities... Made each of his first 12 appearances in relief before making only start on 5/20 vs. Charlotte (3.1ip/3h/6r/5er)...Posted a 1.40 ERA (38.2ip/6er) in his last 27 appearances beginning in June...Recorded each of his 10 saves between 7/1 and 8/30... Had contract selected by Baltimore on 9/1...Made four of his five appearances against the Yankees...Made Major League debut on 9/2 vs. Toronto (1.0ip/3h/4r)...Made final appearance on 9/16 before being designated for assignment on 9/17...Played for Aguilas Cibaenas during the Dominican Winter League. June 18, 2018 Pittsburgh Pirates activated RHP Richard Rodriguez from the 10-day injured list. April 13, 2018 Pittsburgh Pirates selected the contract of RHP Richard Rodriguez from Indianapolis Indians. December 7, 2017 Pittsburgh Pirates signed free agent RHP Richard Rodriguez to a minor league contract and invited him to spring training. December 7, 2017 RHP Richard Rodriguez assigned to Indianapolis Indians. November 6, 2017 RHP Richard Rodriguez elected free agency. September 17, 2017 Baltimore Orioles sent RHP Richard Rodriguez outright to Norfolk Tides. September 17, 2017 Baltimore Orioles designated RHP Richard Rodriguez for assignment. September 1, 2017 Baltimore Orioles selected the contract of RHP Richard Rodriguez from Norfolk Tides. August 21, 2017 Norfolk Tides activated RHP Richard Rodriguez from the temporarily inactive list. August 18, 2017 Norfolk Tides placed RHP Richard Rodriguez on the temporarily inactive list. June 9, 2017 Norfolk Tides activated RHP Richard Rodriguez from the 7-day disabled list. May 25, 2017 Norfolk Tides placed RHP Richard Rodriguez on the 7-day disabled list. January 11, 2017 Baltimore Orioles invited non-roster RHP Richard Rodriguez to spring training. March 4, 2016 RHP Richard Rodriguez assigned to Baltimore Orioles. October 16, 2015 RHP Richard Rodriguez assigned to Aguilas Cibaenas. August 5, 2015 RHP Richard Rodriguez assigned to Norfolk Tides from Bowie Baysox. August 4, 2015 RHP Richard Rodriguez assigned to Bowie Baysox from Norfolk Tides. August 2, 2015 RHP Richard Rodriguez assigned to Norfolk Tides from Bowie Baysox. June 27, 2015 RHP Richard Rodriguez assigned to Bowie Baysox from Norfolk Tides. June 25, 2015 Fresno Grizzlies traded RHP Richard Rodriguez to Norfolk Tides. May 16, 2015 Fresno Grizzlies activated RHP Richard Rodriguez from the temporarily inactive list. May 13, 2015 Fresno Grizzlies placed RHP Richard Rodriguez on the temporarily inactive list. November 6, 2014 RHP Richard Rodriguez assigned to Aguilas Cibaenas. August 23, 2014 Richard Rodriguez roster status changed by Oklahoma City RedHawks. August 20, 2014 Oklahoma City RedHawks placed RHP Richard Rodriguez on the temporarily inactive list. July 21, 2014 RHP Richard Rodriguez assigned to Oklahoma City RedHawks from Corpus Christi Hooks. July 15, 2014 RHP Richard Rodriguez assigned to Corpus Christi Hooks from Oklahoma City RedHawks. July 9, 2014 RHP Richard Rodriguez assigned to Oklahoma City RedHawks from Corpus Christi Hooks. June 3, 2014 RHP Richard Rodriguez assigned to Corpus Christi Hooks from Lancaster JetHawks. May 31, 2014 Lancaster JetHawks placed RHP Richard Rodriguez on the temporarily inactive list. May 19, 2014 Lancaster JetHawks activated RHP Richard Rodriguez from the temporarily inactive list. May 15, 2014 Lancaster JetHawks placed RHP Richard Rodriguez on the temporarily inactive list. May 10, 2014 RHP Richard Rodriguez assigned to Lancaster JetHawks from Oklahoma City RedHawks. May 2, 2014 RHP Richard Rodriguez assigned to Oklahoma City RedHawks from Lancaster JetHawks. April 28, 2014 RHP Richard Rodriguez assigned to Lancaster JetHawks from Quad Cities River Bandits. August 21, 2013 Richard Rodriguez assigned to Quad Cities River Bandits from Tri-City ValleyCats. June 23, 2013 Richard Rodriguez assigned to Tri-City ValleyCats from Quad Cities River Bandits. May 11, 2013 Richard Rodriguez assigned to Quad Cities River Bandits from Greeneville Astros. August 17, 2012 Richard Rodriguez assigned to Greeneville Astros from GCL Astros. July 21, 2012 Richard Rodriguez assigned to GCL Astros from Greeneville Astros. June 4, 2012 Richard Rodriguez assigned to Greeneville Astros from Lexington Legends. June 2, 2012 Richard Rodriguez assigned to Lexington Legends from GCL Astros. August 3, 2011 Richard Rodriguez assigned to GCL Astros from DSL Astros. August 4, 2010 DSL Astros placed Richard Rodriguez on the reserve list. May 26, 2010 DSL Astros signed RHP Richard Rodriguez.